The Micro Bit compact computer board is going global – it'll be available throughout Europe in the next few months, and will arrive in the US and other countries next year. The BBC's Raspberry Pi-alike was given away free to a million school kids in the UK in an effort to drum up interest in coding at an early age, and went on general sale – costing £13, or £15 (around $18, AU$24) for the starter pack – at the end of May. Now the BBC has handed the reins of the project to a new non-profit organization, the Micro Bit Educational Foundation, the CEO of which, Zach Shelby, has said the big goal is to reach no less than 100 million people with the mini-computer. In other words, he expects to sell tens of millions of Micro Bits over the coming decade, with the computer going on sale across Europe before the end of this year, and becoming available in the US, Canada and China in 2017. As the BBC reports, the expansion to North America and China will coincide with a planned upgrade for the Micro Bit, with new sensors expected to be added to the device, alongside a boost in computing power; it will also need more LED lights to cope with Chinese language characters. The organization also notes that, if possible, it will be trying to keep the asking price down when it comes to spreading to developing countries, so that the board is relatively affordable in those nations. 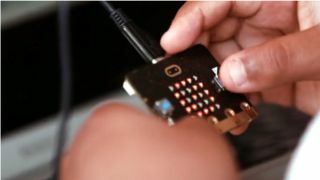 The Micro Bit can be used to code basic programs and games, and can also be hooked up to a smartphone to do things like provide a button for triggering remote selfies. There are plenty of tutorials and resources online, and of course we’ve provided some of our own, including features on coding games on the Micro Bit, and using it as a Minecraft gesture controller. When it first launched the device, the BBC said it was the most ambitious education project the broadcaster had embarked upon in three decades – in other words, since the launch of the BBC Micro home computer. The new Micro Bit foundation certainly isn’t lacking in ambition, either.